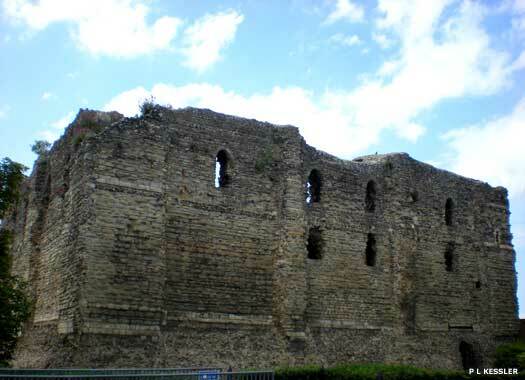 The ruins of Canterbury Castle lie in the south-east of the city, overlooking the Wincheap roundabout. 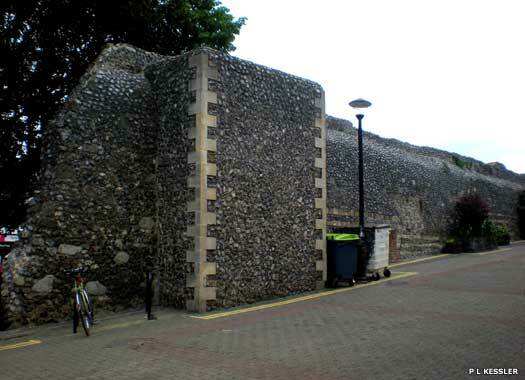 The city wall foundations which shield it from today's traffic are Roman, and on the London and Sturry roads Roman cemeteries of different periods have been unearthed. 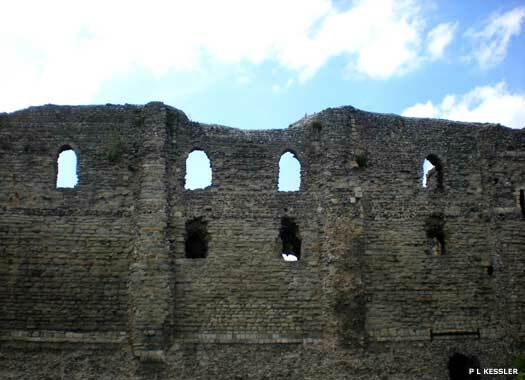 The first castle known to have been built for the city was almost certainly located a little further eastwards from the later stone castle, in the southern angle of the third century Roman city walls. The spot is now the Dane John Gardens. The high mound known as the Dane John, which was landscaped to its present form in 1790, would have been the 'motte', or hill, which supported the wooden bailey, or castle. 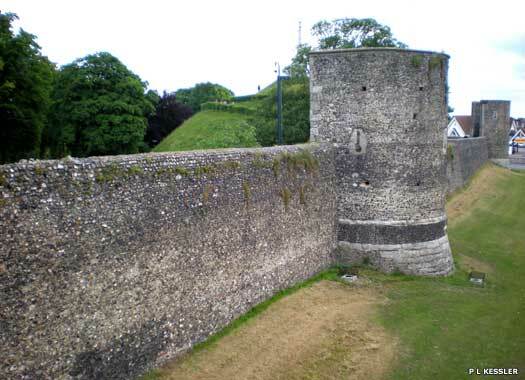 This castle, along with those of Dover and Rochester, were all built around the same time, probably in the winter of 1066-1067 to guard the important main Roman road from Dover to London, the route taken by William the Conqueror in October 1066. 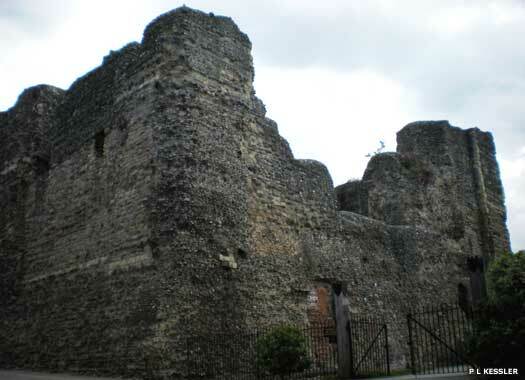 Less than twenty years later the wooden castle was moved to a new site just inside the Roman south gate, which was known as the Worthgate. The Domesday book relates that fourteen houses which were occupied by tenants of St Augustine's Abbey had to be demolished for this and the king gave them the churches of St Andrew and St Mary sub castellum (St Mary de Castro Church) in exchange. 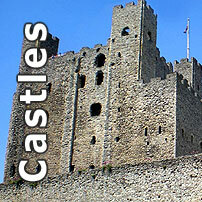 The castle became one of the three royal castles of Kent. Early in the twelfth century, during the reign of Henry I, the great stone keep was built, while the city walls were probably strengthened at the same time. This massive structure was originally something like twenty-four metres (eighty feet) high, made mainly of flint and sandstone rubble with quoins and a plinth of Caen and Quarr stone (from Normandy and the Isle of Wight). The original first floor entrance was on its north-west side, reached via a great external staircase. From the twelfth century at least, the castle was mainly used as a county prison under the control of the sheriffs. On the southern side, the old Roman Worthgate was still in use and people passed through the bailey on their way to Wincheap. In 1548, this gate was blocked and Castle Row was created to bypass the castle. The eighteenth century saw the beginning of the end of the castle's life: the keep was already a ruin and partial demolitions took place in 1770 and 1792. The year 1792 also saw the Roman Worthgate demolished. The second floor was mostly removed in 1817. In 1825 the newly formed Gas, Light and Coke Company bought the keep and pulled out two internal walls to make way for a coal and coke store. An iron water tank was also put on top of the keep, and it was only in 1928 that the keep was acquired for preservation. 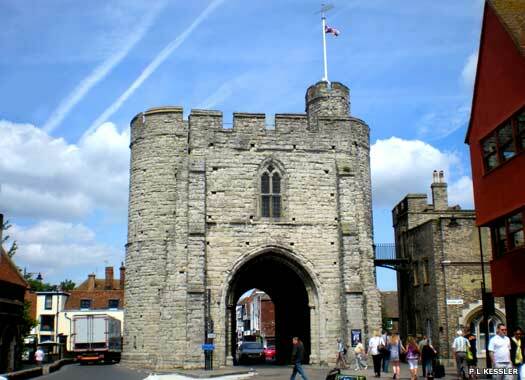 The West Gate (seen here) was rebuilt in its current form in 1381 and survives to this day.